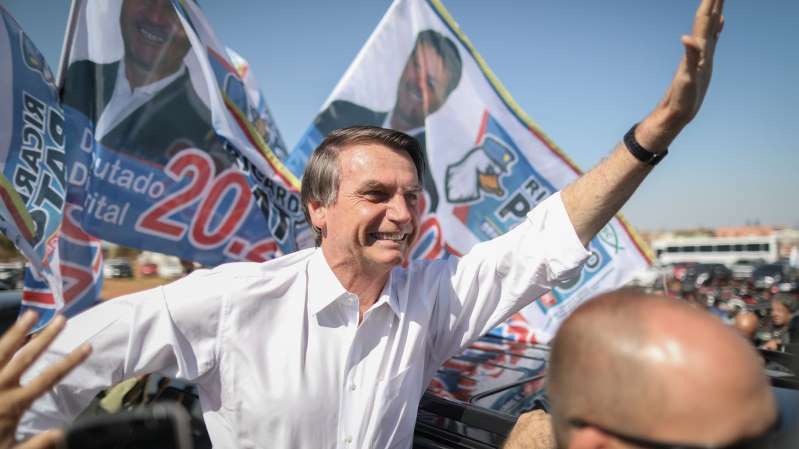 Brazil’s far-right presidential candidate Jair Bolsonaro’s jump in the opinion polls ahead of Sunday’s general elections was confirmed by a second survey released on Tuesday evening. The former paratrooper rose four points to 32 percent in the Datafolha poll, underlining a surge in support observed by another polling firm on Monday. Leftwing Workers’ Party candidate Fernando Haddad saw his vote intentions fall within the margin of error, from 22 percent on 28 Sept. to 21 percent. In a runoff scenario, both men are technically tied, with Bolsonaro on 44 percent and Haddad on 42 percent. Of the 13 candidates running for the presidency on Sunday, Bolsonaro and Haddad are almost certain to make the second round. Brazilian assets surged on Tuesday, following the publication of the Ibope poll which showed an increase in support for Bolsonaro, a seven-term congressman who has pledged to sell-off state companies in the event of victory. Markets eye Haddad warily, fearing a return to the statist policies pursued by previous Workers’ Party governments. As with Ibope, the poll showed that Bolsonaro’s support grew among female voters, despite mass demonstrations over the weekend to protest his views on women. It also grew among Brazil’s most educated voters, as well as those with incomes five to ten times the minimum wage. The Datafolha survey of 3,240 people was conducted in 225 municipalities on Oct. 2 and has a margin of error of plus or minus 2 percentage points. The Datafolha poll -- BR03147/2018 -- showed Bolsonaro still has the highest rejection rating of any candidate, at 45 percent, but the survey also showed Haddad’s rejection rating rise from 32 percent to 41 percent. Datafolha does not run polls for politicians or political parties, according to its website.